CIRCA 1919 - Generals Gordon and Dashiell pose with their junior officers in France. hd00:121940s: Family sits around dining table in home. Boy shows family piece of paper from pocket. Father reads it. 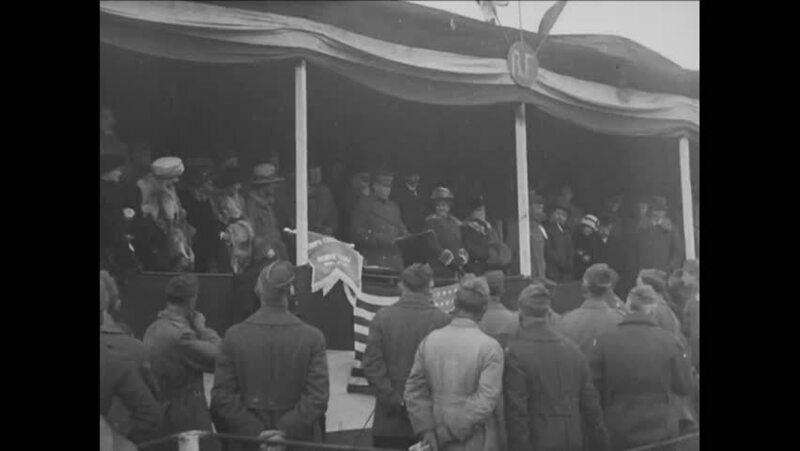 hd01:19CIRCA 1918 - Troops of the 79th Division march for review before Generals Pershing, Kuhn, and other officers. hd01:11CIRCA 1916 - Armed forces distribute food to Mexican villagers. hd00:16UNITED STATES 1950s: Young People Gather Together in Room to Study. Men Turn to Look at Camera. Group of People in Crowded Room Turn to Look at Camera. Men and Women Walk Along Busy Sidewalk in City. hd01:19CIRCA 1944 - A soldier throws away his gas mask right before a gas attack creeps up on him. hd00:46CIRCA 1916 - Mexican men, women, and children are grouped together during the Punitive Expedition. hd00:52CIRCA 1950s - Soldiers are debriefed on an aircraft mission and the mission is shown.